This is a very elegant and stylish fully furnished 2 bedroom apartment on the first floor, opposite a lovely park and the imposing historical acquedotto, only 12-15 min walk from the beautiful city centre and main train station. A gem in a precious town. The apartment has a large living area and dining space; a separate practical and very functional kitchen, with all crockery and glassware provided; two small but independent bathrooms; a large double bedroom and a studio that can be converted into a second bedroom (with sofa bed). It is fully furnished and all homeware is provided. This includes: bed linen, towels, hairdryer, bowls, kitchen utensils, cooking pans, soap, shampoo, cleaning detergents. Please note WiFi is not provided. The accommodation is a well looked after and loving family home. It is rented as such as we truly want to give our guests a genuine welcoming and homey environment, so that they can make the most of their experience in this beautiful historical town. Hoping they will fall in love (as we have) and visit again! Therefore, we ask our guests to kindly consider it as their own home and show respect towards the facilities provided, the building and the neighbours. With easy parking on the main and side roads, the location is very close to the historical centre: if you are planning to jog or cycle around the city walls, these are just steps away. The zone is quiet with plenty of green area around and very easy to access by car as well. Planning your trip to Bologna or Venezia, is easy enough and your visit can be done in a day! Upon request, small (house trained) pets are allowed and smoking is permitted only in the outdoor areas (not inside the property). It's not accepted reservation of a number of people higher than that indicated as maximum capacity (4 adults). The arrival of a number of persons higher than booked will automatically cancel the reservation of the stay and make the payment not refundable. Reservations for a stay less than a week long must be cancelled within 48 hours before the arrival. Otherwise the fee for the whole period reserved will be charged. Reservation for a stay longer than a week, up to a month, will be charged for the whole period reserved ahead of arrival, even if the guests should interrupt their stay for any inconvenience. The arrival of a number of persons higher than booked will automatically cancel the reservation of the stay and make the payment not refundable. We much enjoyed our stay here. Apartment feels like you are living like a local - which indeed you are. Very quiet neighbourhood, with lots of trees, and near local cafes and shops. You can walk to both train and bus stations. 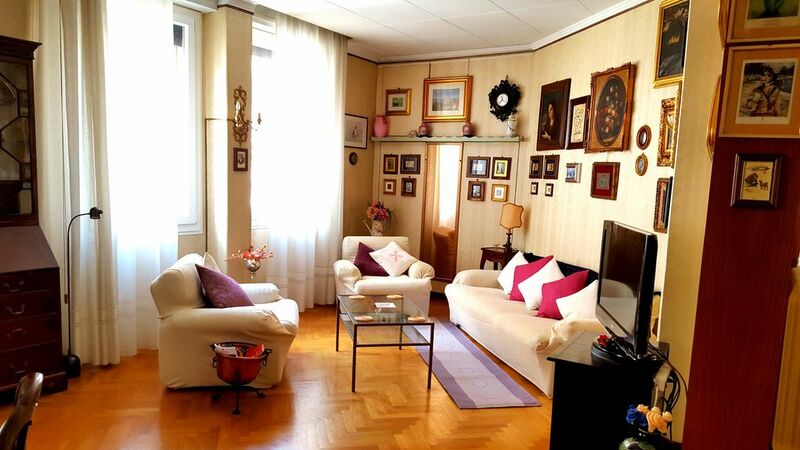 Apartment is on first floor, has lovely old family furnishings, and a modern and very well equipped kitchen. Two bathrooms is always a plus! Nice views over local park. Our hosts were very helpful, even driving us plus heavy bags to the station at the end. What's not to like? Thanks you sooo much for the lovely review! It was a true pleasure having you as guests, you could not have been better and more respectful visitors! Bello appartamento spazioso e ben ubicato con mobili d'epoca ma bisogna d'un facelift tecnico. Nessuno wi-fi, illuminazione decrepita allora la notte quasi buia) , manca di climatizzazione, allora non piacevole in estate. bell'appartamento, signorile. massima disponibilità da parte del proprietario e dei suoi collaboratori. The apartment is a well looked after and loving family home. It is rented as such as we truly want to give our guests a genuine welcoming and homey environment, so that they can make the most of their experience in this beautiful historical town. Hoping they will fall in love (as we have) and visit again! Therefore, we ask our guests to kindly consider the apartment as their own home and show respect towards the facilities provided, the building and the neighbours. Upon request, small (house trained) pets are allowed and smoking is permitted only in the outdoor areas. It's not accepted reservation of a number of people higher than that indicated as maximum capacity. The arrival of a number of persons higher than booked will automatically cancel the reservation of the stay and make the payment not refundable. Reservations for a stay less than a week long must be cancelled within 48 hours before the arrival. Otherwise the fee for the whole period reserved will be charged. Reservation for a stay longer than a week, up to a month, will be charged for the whole period reserved ahead of arrival, even if the guests should interrupt their stay for any inconvenience.